Ideal for helping to prevent slips and falls. 3M Safety-Walk Heavy Duty Tread helps to reduce trip hazards and provides a long life span in heavy traffic. The tread is easy-to-use and won't harm surfaces. It's a pressure-sensitive adhesive with a removable protective liner and applies like tape. The strong adhesive backing helps resist cracking and peeling and adheres to surfaces including wood, metal and smooth concrete. 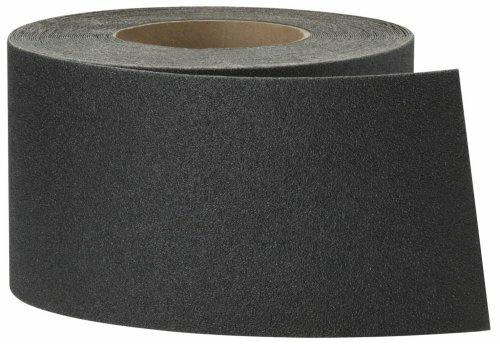 Size: 4" x 60' Color: Black Heavy duty Easy-to-use Won't harm surfaces Pressure-sensitive Use anywhere safe footing is desired Ideal for helping to prevent slips and falls Strong adhesive helps to resist cracking and peeling. Black Anti-Fatigue Floor Mat Indoor Commercial Industrial Heavy Duty Rubber Floor Mats 36" 60"